This is the continuation of my previous post. If the previous post was all about Korean Street Food guide, then this time I'm going to share the "restaurant" version. Although what I had back then when I was in Seoul were not exactly the BEST of the best in its category, at least you'll get a depiction on what kind of food to try when visiting Seoul. Korean comfort food at its best! I have been obsessed with Jjajangmyeon (Black Bean Noodles) ever since my college friend introduced me to Korean dramas. Back then I would search the recipes on YouTube, go to Korean grocery store in Mu Gung Hwa Jakarta to find the ingredients, then tweaked and cooked my own version of this scrumptious bowl of black bean noodles. That's why when I had the chance to visit its origin country, this was just on top of my must-eat list. And yes, it definitely didn't disappoint. There were way too many Jjajangmyeon shops across Seoul, even you can find it on local minimarkets. I chose this restaurant in Insadong (can't read Hangeul so I don't know what to refer it as :p), because it has an appetizing pic of Jjajangmyeon outside of the restaurant. Turns out it tasted really good, nice texture of chewy noodles, and well-balanced jjajang (black-bean sauce). The spicy seafood noodle also didn't disappoint - moreover with its HUGE portion. A bowl of jjajangmyeon and any other noodle menu often costs around ₩4,500 - ₩5,500. Give it a try! Dak-Galbi, is one of the popular dishes in Korea, which is basically stir-fry marinated chicken basted in gochujang (Korea's most famous condiment, chili pepper paste) with lots of vegetables and tteok (rice cakes) in a hot pot. It's also a popular dish for those who are on a low budget (university students, and of course us backpackers :p), as dak galbi is relatively cheap around ₩5,500 - ₩8,000 for up to 3-4 people, and served in abundance. 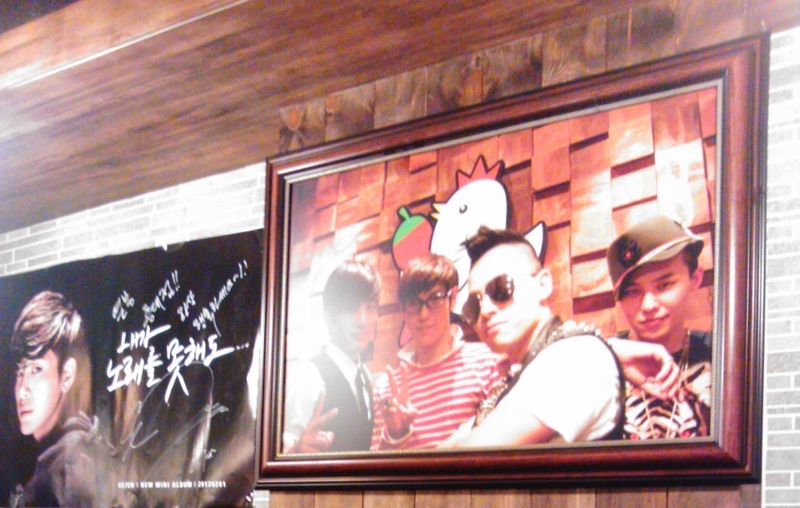 I found this restaurant called 'Yoogane' in Myeongdong, which looks very crowded especially on dinner time. Honestly I chose this place because they provide English menu, lol. We chose Dak-Galbi fried rice, and it tasted really nice, fulfilling, and kick the right amount of heat. In one windy night in April, my senior who worked in Seoul promised to take us to hang out around Hongdae. Hongdae is an area/district located near Hongik University, popular for its urban arts and indie music street-performance, along with its famous nightlife with clubs and entertainments that opens 'til dawn. So she took us to Yeolbong Jjimdak 열봉찜닭 near the uphill main streets of Hongdae, which apparently belongs to K-pop singer named 'Se7en'. And yes, from the 2nd floor up to the 3rd floor, you will see some kind of Wall of Fame with LOTS of small framed photos of K-pop artists who have visited the restaurant, from BIGBANG, Rain, SNSD, and only God knows who else (I have a really bad memory for Korean names :p). But I'm pretty sure they're all under YG Family, because YG Entertainment (Korea top agency) is also located near the street. Tips #1: While you're in Hongdae, why not visit Hello Kitty Cafe as well? It's all within walking distance, so.. yeah, that makes a really nice photo spot! :) They serve almost every menu in the shape of Hello Kitty's head, so you'll get things like hello-kitty wall, waffle/pancake kitty, and hello-kitty latte art, etc. Tips #2: While you're still wandering around Hongdae and you're a big K-drama fan, why not make a visit to an old coffee shop that is being remodeled for 'Coffee Prince' drama shooting? Too bad when I came there, it's closed due to private party. No, seriously. It was the cheapest option available at that time. I stumbled upon this small shop near my hostel (Sungkyunkwan area), and turns out its skewered fried chicken was REALLY really good. They intend to sell it as snacks with ₩1,700 - ₩1,900 a stick, but why not making it full main-course? So we bought instant rice at the nearest minimart (around ₩700 - ₩1,300), plus seaweed ₩300 - that makes a total of ₩2,800 (IDR 25.000,-) for 1 meal! Haha. Won't find anything else as cheap & fulfilling as these. Since I can't read hangeul, I'm sorry I can't tell you the chicken stall's name. They offer both fried & grilled chicken skewers, but I prefer its fried chicken. Chicken breast spread on a stick and then coated with batter then fried until crisp & crunchy, then added your choice of sauce. They have 7 types of basting sauce: sweet, spicy, salty, Korean style sauce with mustard & peanuts (WINNER! Hands down! ), curry, and super hot spicy. They also have small bite sized chicken in a cup (+ they added extra fried tteokbokki in it) which is sold for ₩2,000 and ₩6,000 for family jumbo bucket. If I were a student living in Seoul, I'd survive over these cheap goodie any day of the month. Don't worry, you can almost found stalls like this almost anywhere, for the grilled skewers it is often available in any street-food carts especially in Myeongdong. ANYTHING ELSE I SHOULD TRY IN SEOUL? To close this round-ups of Korean culinary, it would not be complete without the accompanying drinks. Have a sip of Soju, the distilled Korean liquor which taste is comparable to vodka, or if that's too strong for you, try Makgeolli (Korean rice wine) instead, with a much lower alcohol percentage. Have a blast in Korea!